In a previous post, I wrote about an experiment at building a solenoid pinch-valve, as an inexpensive alternative to the exorbitantly-priced solenoid valves commonly used in automated homebrewing systems. That attempt was a failure, not even able to seal against 5psi pressure. 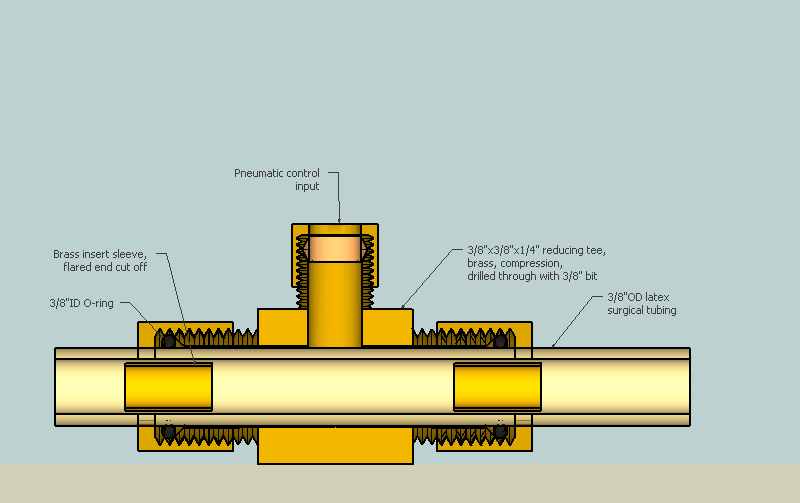 I have since attempted another approach: a pneumatic pinch valve. The idea here is that the fluid is carried through a length of flexible tubing, and that flexible tubing is run through a rigid jacket that can be pressurized with air (or another gas or fluid). 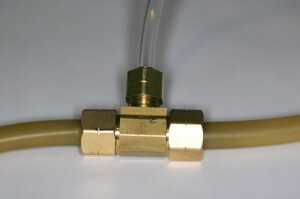 If the control pressure is high enough, it will squeeze the flexible tubing shut, and pinch off the flow of the fluid. The air pressure can be controlled by a much smaller and less expensive solenoid valve. Pneumatic control valves can be had for $30. Extremely low restriction when fully open. It’s just a straight-through length of tubing. It’s even possible to implement a variable throttling valve, by adjusting the air pressure somewhat lower than required for complete pinch-off. You probably don’t need a compressor to provide the control pressure. As a high-level homebrewer, you probably already have a CO2 tank and regulator. That will do just fine for operating these valves, and the amount of CO2 consumed cycling valves in a brewing session will not be very much. The question is, how do we build one? I have made my first prototype of such a valve. I built it using 3/8″OD latex tubing, but that’s not really acceptable for a brewing system. A real one should probably be larger (1/2″OD) and use a flexible tubing that will not impart any rubbery taste. There are a variety of Tygon tubings that would be perfect in this application. 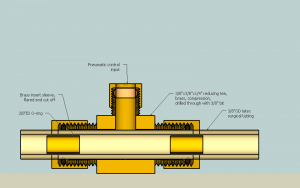 The heart of the valve is a 3/8″x3/8″x1/4″ brass compression tee, which has been drilled through so that the 3/8″ tubing can pass all the way through. The 1/4″ port of the tee is where the control air comes in. If you’re worried about lead in brass (a concern that I think is overblown), it’s not a problem here. The wort does not come in contact with the brass. The seals at the two straight-through ends of the tee will have to resist the control pressure, or you’ll have leakage and waste CO2. Since the latex is very flexible, I used the thin brass insert sleeves that came with the tee, so that the compression nut would be able to compress. (Ok, so the wort is touching brass now… but it’s just a small-scale prototype.) Since I’m running a single piece of tubing all the way through the tee, I had to modify the inserts, cutting off the flared end with a cut-off wheel on the Dremel. Then the inserts could be worked right inside the tubing, and slid into place so they would end up inside the compression point of the tee. Nothing really holds them in place, though, in this prototype. Also, the brass compression sleeves that came with the tee didn’t work, they couldn’t seal against the soft latex tubing. I replaced them with 3/8″ID O-rings, which seemed to do the trick. With the control pressure cranked up to 30PSI, there was no air leakage around the tubing. I hooked the 1/4″ port of the tee up to my CO2 tank and regulator, just quickly slapping it together, with a blow-gun head to control it. I hooked up the input side of the valve to the household water pressure, which I have measured at around 48psi. When I tried it out, I found that 20psi control pressure slowed down the flow of water, but did not stop it. Cranked up to 30psi, the valve was able to completely shut off the household water supply. I couldn’t leave it shut off for long, though, because the water pressure was enough to inflate the latex tubing like a balloon, and it would burst if I left it for long. This pinch valve should be way more than adequate to control the output of the March 809 pump typically used in RIMS systems, which is only about 5psi. With this small-size prototype apparently being a success, I will next attempt a larger-scale pneumatic pinch valve. So, forgive me if I’m being dense…but don’t you now need a valve to turn the air pressure on and off? How are you going about that? That’s true. But a solenoid valve for air can be much smaller and cheaper.